(CNSNews.com) - President Trump is once again venting his outrage over reports in liberal newspapers that the Trump-Russia probe began secretly in 2016 when the FBI sent an informant/informants to make contact with low-level Trump campaign advisers. A lot of people are saying they had spies in my campaign. If they had spies in my campaign, that would be a disgrace to this country. That would be one of the biggest insults that anyone's ever seen. That would be very illegal, aside from everything else. It would make, probably, every political event ever look like small potatoes. So we want to make sure that there weren't. I hope there weren't, frankly. But some man got paid, based on what I read in the newspapers, and on what you reported, some person got paid a lot of money. That's not a normal situation, the kind of money you're talking about. So hopefully that would be -- and I think the Department of Justice wants to get down to it, and I can tell you Congress does. So hopefully they'll all be able to get together. General Kelly's going to be setting up a meeting between Congress and the various representatives and they'll be able to open up documents, take a look and find out what happened. 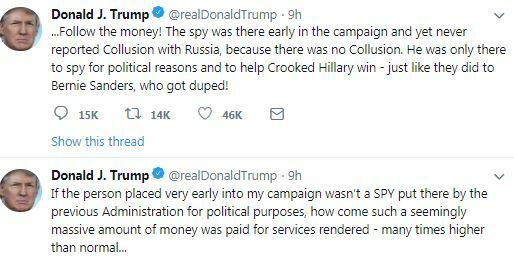 But if they had spies in my campaign -- during my campaign -- for political purposes, that would be unprecedented in the history of our country. The alleged "spy" is an American professor, now working at Cambridge University in England, with ties to U.S. and British intelligence. He's been named by multiple media outlets. Press reports say he was paid hundreds of thousands of dollars by the U.S. government, but it's not clear for what. At Tuesday's White House press briefing, spokeswoman Sarah Huckabee Sanders was asked about Thursday's scheduled meeting at the Justice Department, where House intelligence committee Chairman Devin Nunes and House oversight committee Chairman Trey Gowdy will finally get a look at documents explaining how the Trump-Russia probe started. That meeting at the Justice Department is being set up by White House Chief of Staff John Kelly, at the request of President Trump. "I can tell you the President asked Chief of Staff Kelly to set up the meeting," Sanders told reporters. "It is scheduled to take place on Thursday of this week. "The individuals that are expected to attend are Chairman Nunes, Chairman Gowdy, FBI Director (Christopher) Wray, DNI Director (Dan) Coates and DoJ Official Ed O'Callaghan (Rod Rosenstein's deputy). No one from the White House staff will attend," Sanders said. She said even John Kelly is not expected to be there. A reporter asked Sanders why no Democrats will be at the meeting when the long-requested classified documents are revealed. "We'll keep you posted," Sanders said. "To my knowledge, the Democrats have not requested that information. So I would refer you back to them on why they would consider themselves randomly invited to see something they've never asked to."